These three excellent discs are the first to emanate from a series that is to be devoted to that rich seam of British Light Music by the ever enterprising Guild label. As is indicated by the titles, the first disc offers a wide ranging selection of pieces that is titled as an introduction while the other two discs are dedicated to specific decades in what was supposedly the heyday of this beautiful genre. The music was compiled by that doyen of BLM, David Ades who has already contributed so much to Michael Dutton's many releases dedicated to Robert Farnon, Mantovani and The Queen's Hall Light Orchestra series. Volume 1, as I am wont to call it contains quite a few pieces that have been duplicated in various discs on the Dutton Vocalion label, mostly the Queens Hall items. 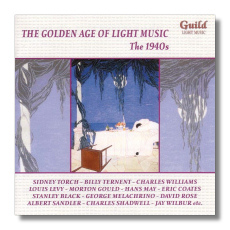 The great composers such as Farnon, Charles Williams, Sidney Torch and Eric Coates all have some small pieces whilst there are also the rarer items by David Rose, Duncan's 'Vision in Velvet' and an interesting tidbit from Morton Gould. This issue serves as a useful introduction to the multi-faceted style of the genre and is expertly annotated by David Ades with recordings ranging from the 30's to the 50's. The second volume dates from the 1940's with about twenty short pieces from a veritable plethora of artists. Among the more memorable are a delightful 'Waltz from The Three Bears" conducted by Eric Coates himself and a number of other intriguing pieces such as 'Ascot Enclosure' by Yorke, 'Wagon Lit' by Sidney Torch and a fine medley of Irving Berlin themes titled 'Blue Skies'. The recordings sound quite well for their age and again, the remastering is excellent. 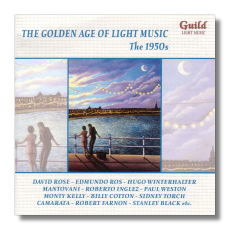 In 'The 1950's' we are regaled with another delightful collection of tunes from such masters as Robert Farnon, Frederic Curzon, Mantovani and a host of other composers and artists. Addinsell's beautiful 'Festival' is wonderfully done by Mantovani and his orchestra whilst Henman's 'Champagne March' veritably bubbles over in Robert Farnon's exquisite interpretation. The disc ends with another medley, this time from various film hits, performed with style by the inimitable George Melachrino. As a lover of the genre, I can live with the inevitable duplication that entails when collecting such recordings. 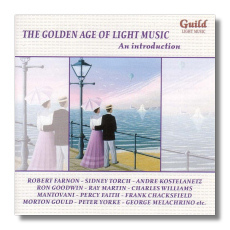 It is now to be hoped that Guild will focus on some neglected areas of this genre with such important composers such as Curzon, Haydn Wood, Trevor Duncan and Ernest Tomlinson receiving their full due through individual collections. However, these discs deserve all the widest currency and are highly recommended to all those who wish to begin exploring this fabulous genre.